Coaching American Soccer is pleased to announce a partnership with easy-sports-software.com. All soccer graphics and animation used throughout the Coaching American Soccer publications are generated using software from easy-sports-software.com. As a part of this partnership, Coaching American Soccer is pleased to offer a 10% discount on the easy Sport-Graphics – Soccer and easy Animation – Soccer software packages. When checking out enter discount code CAS2012. easy Sports-Graphics is a graphic software package for coaches. It is perfect for the amateur graphic designer to produce high-quality soccer graphics that look professionally generated. The product can be used to create low- or high-resolution “jpeg” images for: preparing training sessions, websites, articles, presentations (e.g. with PowerPoint), and books. easy Animation for soccer is designed for anyone who needs to add animation to a presentation. 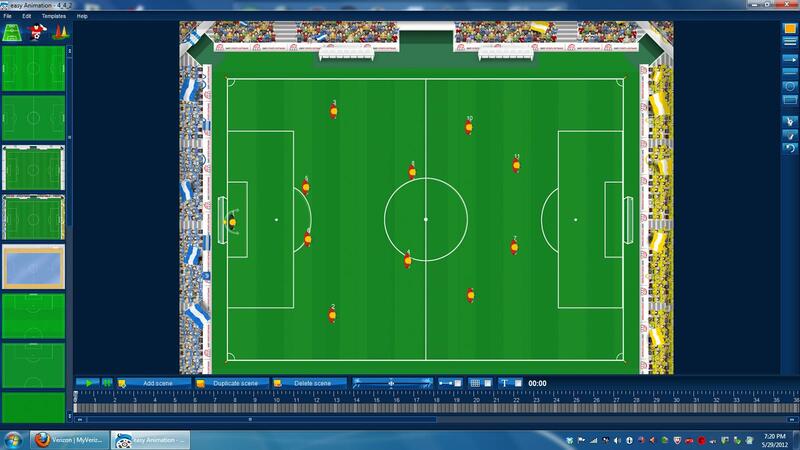 Animate any soccer activities, formations and drills. The animation software is a revolution for today’s modern coach. The animations can be exported into either “AVI” or “FLV” formats. This permits the files to be used by all popular presentation software (Word, PowerPoint…), Web Sites, and all email packages. Soccer words or phrases not otherwise defined above may be found in The ULTIMATE SOCCER DICTIONARY of American Terms available at Amazon.com.